Place the cursor on a macro call in the editor, right click, select from the pop-up menu Macros and then the desired expand type. Expansion also works for an entire region of code, and all macros in the selection will be expanded. DVT also marks inline macro expansions in the code and collects them in the tasks view to allow easy tracking. You can choose to expand only the first level (i.e. further macro calls inside the top level macro are not expanded) or all levels. You can quickly collapse a macro expansion by right-clicking on its marker. Place the cursor on the expansion start pragma, and select Collapse Inline Expansion. Do not modify the pragmas generated by DVT because this might break the collapse functionality! 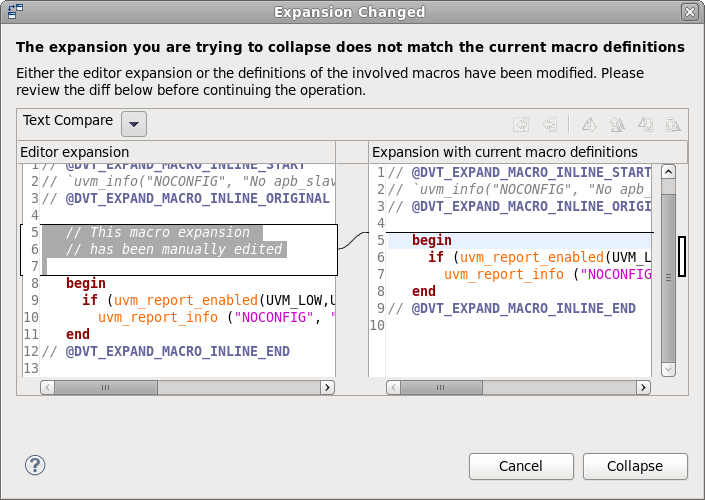 DVT will notify you if the macro expansion in the editor does not match the current macro definitions. This may happen either because the expansion or the macro definitions have been modified since the macro was expanded. A compare window will display the differences between the editor expansion and the expansion with current macro definitions.